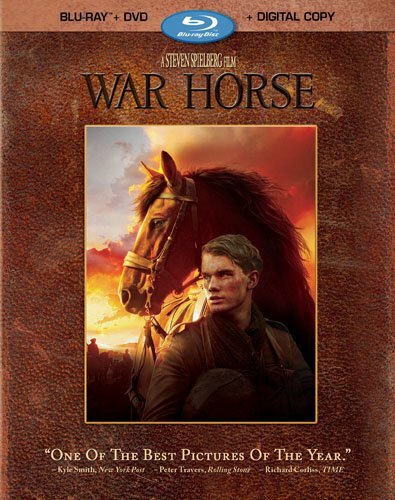 The extraordinary journey of courage and friendship as seen through the eyes of one unforgettable horse named Joey and his miraculous journey to find his way back home, War Horse is a must own contemporary classic for everyone's home entertainment collection. Spielberg's renowned creative passion and artistry not only shine throughout the film but are also evident in all the fascinating bonus features included exclusively on the Blu-ray disc. The premium 4-Disc Blu-ray Combo Pack in particular allows viewers to explore the filmmaking process and storytelling adventure though a special 60 minute documentary (named "A Filmmaking Journey"), created by Spielberg, that offers a never-before-seen inside look into the making of "War Horse" Additional bonus features include a behind the scenes look at Spielberg's Award-Winning "Dream Team" - the film's scoring session with five-time Oscar-winning composer John Williams, the editing room with three-time Academy Award winning film editor Michael Kahn, the sound room with seven time Oscar-winning sound designer Gary Rydstrom, and a look through Producer Kathleen Kennedy's lens as she shares photos she took during the filming and recounts her discovery of "War Horse." BURBANK, Calif., February 21, 2012 - Legendary Academy Award(R)-winning motion picture director/producer Steven Spielberg presents the critically acclaimed and multi Academy Award(R)-nominated epic adventure War Horse on Blu-ray(TM), DVD, Digital and On-Demand, April 3. This newest home entertainment release not only enthralls viewers once again with its visually stunning and emotionally heartwarming story on the Blu-ray, but also offers an unprecedented look into the making of the film by Spielberg himself. The premium 4-Disc Blu-ray Combo Pack in particular allows viewers to explore the filmmaking process and storytelling adventure though a special 60 minute documentary (named "A Filmmaking Journey"), created by Spielberg, that offers a never-before-seen inside look into the making of "War Horse ." Additional bonus features include a behind the scenes look at Spielberg's Award-Winning "Dream Team" - the film's scoring session with five-time Oscar-winning composer John Williams, the editing room with three-time Academy Award winning film editor Michael Kahn, the sound room with seven time Oscar-winning sound designer Gary Rydstrom, and a look through Producer Kathleen Kennedy's lens as she shares photos she took during the filming and recounts her discovery of "War Horse ." * A Filmmaking Journey - Academy Award(R)-winning Director/Producer Steven Spielberg provides a unique and unprecedented look into the making and filming of "War Horse." * Editing & Scoring - Multi-Oscar(R) winners Michael Kahn (film editor) and John Williams (composer) discuss specific aspects of editing the film and composing music for "War Horse," as well as the secret to their long and successful collaborations with Steven Spielberg. * The Sounds of "War Horse" - Seven-time Academy Award(R)-winning sound designer Gary Rydstrom takes us through the sophisticated sound design he created for "War Horse." * Through The Producer's Lens - Producer Kathleen Kennedy shares the photos she took during filming and recounts how she discovered the source material, as well as her appreciation of Steven Spielberg's vision, the team that sounds him, and why "War Horse" appealed to her. * "War Horse": The Look - Director/Producer Steven Spielberg introduces us to his creative team of production designer Rick Carter, costume designer Joanna Johnston and director of photography JanuszKaminski, who discuss what it took to design the look for the film. * An Extra's Point of View - Film extra Martin Dew explains how and why he was brought in--along with a hundred other men--to be featured alternately as both German and British soldiers. Stay connected with the latest news and information on DreamWorks Pictures' "War Horse." "War Horse," the Academy Award(R)-nominated Best Picture, is a story of incredible friendship, loyalty, courage, hope and tenacity. Based on the Tony Award(R)-winning play, and set against the sweeping canvas of World War I, this deeply heartfelt tale begins with the remarkable friendship between a feisty colt named Joey and his young trainer Albert (Jeremy Irvine). When they're forced apart by war, the film follows Joey's extraordinary journey as he changes and inspires the lives of everyone he meets. No matter where they go or what they experience both boy and horse keep forging ahead, driven by devotion and the hope of returning home. Filled with spectacularly rich visuals, "War Horse" is one of the most powerful and moving stories of friendship and love ever filmed. DreamWorks Studios is a motion picture company formed in 2009 and led by Steven Spielberg and Stacey Snider in partnership with The Reliance Anil Dhirubhai Ambani Group. The company recently released "The Help," which has been nominated for 4 Academy Awards(R) including Best Picture, Best Actress and Best Supporting Actress. Upcoming releases include Steven Spielberg's "Lincoln." DreamWorks Studios can be found on Facebook at http://www.facebook.com/DreamWorksStudios and on Twitter at http://twitter.com/dwstudios.